I've been saving this last till today, (read her other suggestions) and it seems even more pertinent daily as we listen to people aspiring to the presidency of the U.S. who don't seem have accurate knowledge of our nation's history. Part 4: stories, songs, poems, documents, folk tales, histories that speak to us of our country; that show us where we came from and who we are and who we can become, and instill in us pride in being American. Let's share novels we've read, plays and movies we've seen, songs we've sung, biographies and autobiographies that inspired us, speeches we've heard -- all and any of which show us at our best and at our worst, in our failures and in our successes what it means to be an American. As a resource and starting point I would recommend, as a household reference, A PATRIOT'S HANDBOOK edited by Carolyn Kennedy. Perhaps we could set aside the month of July for patriotic reading and retelling of tales and singing of songs around a campfire and sharing of those things that inspired us as youngsters. 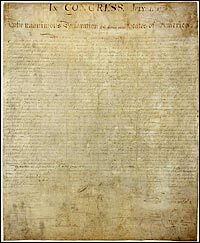 Perhaps we can start a tradition of every 4th of July reading aloud The Declaration of Independence - or at least parts of it - or listening to it being read on NPR. Listen here. Read here. I'm willing to start making lists. What say you? Thank you dear Teacher, we will! First we will listen and then each of us will begin our lists, watch for them! Start your lists, please comment below! And Happy 4th! We have to add all of our favorite Howard Zinn books, we'll make a list! This is going to be LONG! And wonderful, thank you for the suggestion! We have listened to so many of President Obama's speeches --I learned so much during his election in 2008!